This Kulambu will always hold a special place in my heart. It would be really hard to believe if I tell that I had this kulambu in an Anglo-Indian’s house. 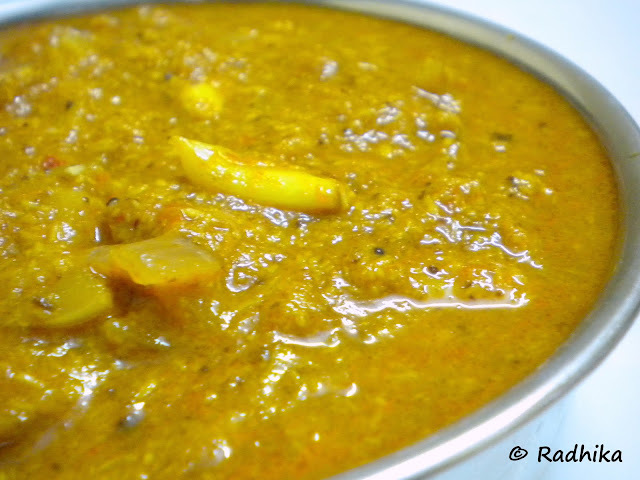 This recipe is from a colleague’s mother who had settled in Karakudi during her early days before shifting to Chennai. One day when I had this lunch from her I knew immediately I should get the recipe from her mother. She was kind enough to invite me to her home and preparing this dish while I watched her playing a perfect hostess. This happened years before and always finds a special place in lunches when relatives are visiting and this has never failed me so far from me being appreciated. Heat oil in a kadai and add the ingredients for the chettinad masala and roast one by one separately. Roast grated coconut and poppy seeds together to prevent the poppy seeds from getting burnt. Let it cool completely. Grind into to a fine paste using little water. Soak tamarind in hot water and extract pulp. Chop the onions and tomato finely. Cut the brinjals length wise and chop the half into sections. Immerse in water to prevent discoloration. Now heat the oil in a thick bottomed kadai, add mustard seeds, and let it splutter. Then add asafetida, curry leaves, fenugreek seeds and sauté for 2 mins. Add onions and garlic, sauté till they turn translucent. Now add chopped tomato, fry well till it gets slightly mushy and raw smell goes off. Add the chopped brinjals, mix well and cook for 5 mins with a lid closed in its own steam. Now add the ground paste and mix well. Cook with lid covered for 2-3 mins. Now add the extracted tamarind water, salt and mix well. Add extra water depending on the thickness of your gravy. Add the jagggery powder at this stage if using. Let it cook on medium flame till the raw smell disappears and the oil starts separating. Serve with hot rice and a dash of ghee. 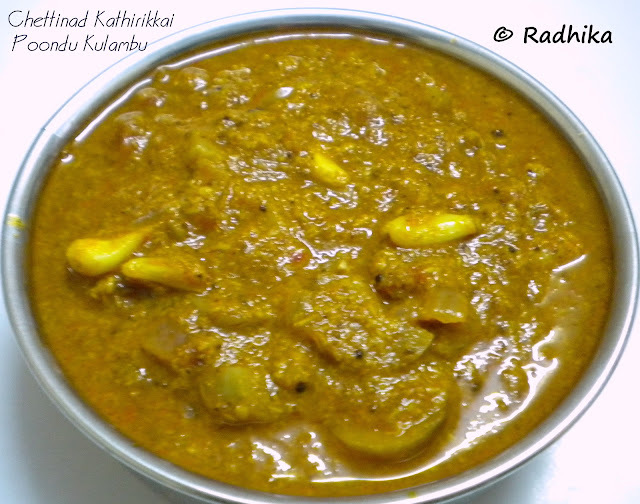 I love this kulambu very much because of the chettinad masala and the spiciness. If you are looking for a perfect side dish to go with this kulambu try this Potato Oil Roast or this Chettinad Vazhakkai Curry. Finger licking Delicious. Note: Use Gingelly oil for authentic taste. I normally don’t use jaggery as the others in my family don’t prefer it. Wow the kulambu looks absolutely tempting and delicious recipe. nice and yumm..will try this tomorrow..
Curry looks amazingly tasty and spicy. Seems to be a mouthwatering preparation. Lovely medley of flavours are in this kulambu…I will surely want to eat this with my rice. Loks fantastic!!! Too bad i missed this event 🙁 I love chettinad cuisine.. The kozhambu looks very yummy and mouthwatering! 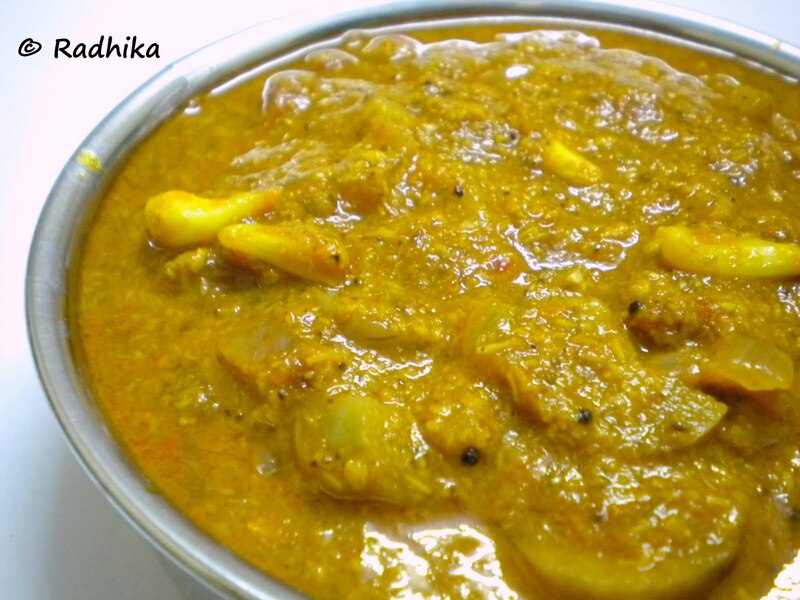 Slurp,soooo irresistible and fingerlicking kuzhambu..
Mmmm yummy…The sauce looks so rich and delicious..looking at the clicks itself makes me crave for it..great recipe..thanks for sharing! 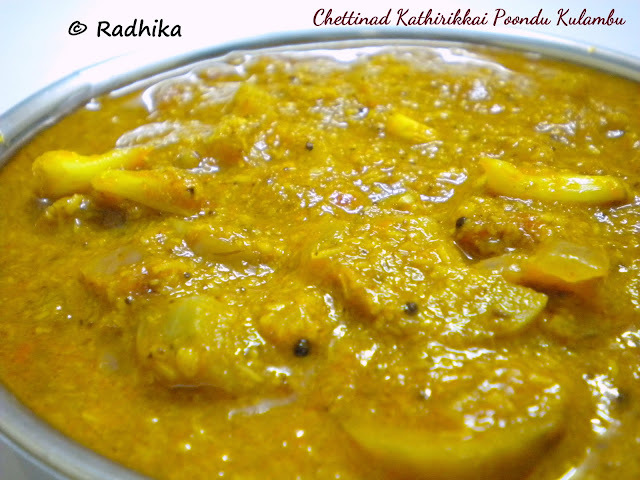 Chettinad kathirikkai poondu kulambu looks delicious and creamy. Love it. wow this looks so delicious and wonderful !! Curry looks soo spicy and flavorful..Slurppp!! I prepared this last week and it tasted absolutely delicious. thanks. I prepared this dish last week. It tasted very delicious indeed.